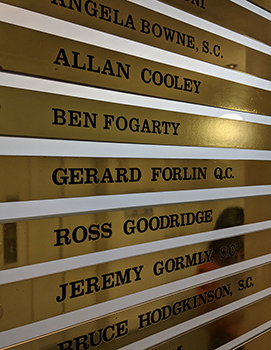 Gerard Forlin QC of Cornerstone Barristers (previously 2-3 Gray’s Inn Square) was educated at the Trinity Hall, University of Cambridge and the London School of Economics. He acts for global organisations and companies and specialises in regulatory work, including health and safety, aviation, marine, environmental and product liability. Gerard has acted in over 200 fatality cases and has been in many of the pivotal cases, including the Watford, Southhall, Teebay, Paddington, Hatfield and Purley train crashes, the Barrow, Legionnaires case, a lift fatality in the city of London and a recent inquest into a 2003 catamaran incident in Greece. In aviation, Gerard has acted for many airports, manufacturers, airlines and regulators. He undertakes a lot of inquest work and has lectured, practised or consulted in over 35 countries. He has published over 90 articles and is General Editor of “Corporate Liability – work related deaths and criminal prosecutions”, 3rd Edition 2012 (Bloomsbury). He has been mentioned in five sections of the Leading Independent Directories, namely Health and Safety, Crime, Environmental, Consumer and Public Inquiries and Inquests. Gerard has recently been appointed to the Royal Aeronautical Society Legal Panel of which there are only 14 members worldwide. He is only one of two Queens Counsel on this worldwide panel. Gerard is also General Editor of ‘Corporate Liability’: Work related deaths and criminal prosecutors (Bloomsbury 3rd Edition). He has been recommended in five areas of the leading guides to the Legal profession including Health and Safety, Environmental, Product Liability, Crime, and Inquiries and Inquests.